Our interpretation of history as well as our time, as it unfolds, are influenced by what we see, watch and read. How authentic, reconstructred or falsified they are? How are we influenced about how images conveyed messages? Do you recall the photograph in the title, which became famous for being altered to convey misleading information and manipulation of viewpoint and is well-known for this reason by the rather conscious ones among us? The photograph in the middle appears to be the original, while the image on the left side appeared on Al-Jazeera and the one on the right side appeared on CNN. This is a perfect and striking example of the power media has to manipulate our perception of what is happening around us. We see the same photograph altered and misused, such that it serves the world-view and the politics adopted by its publisher. 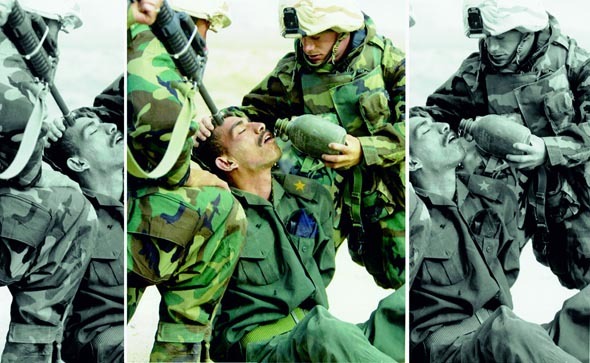 It is quite shocking how international media giants can manipulate a photograph, causing the image to be perceived in a way, that is completely different than it originally is. Even in an age that lacked today’s social media platforms or media giants, manipulation of viewpoint was a common practice via image alterations. For instance, Stalin has very graphically removed people from historical record. Similarly, British during World War chose to share a photograph with the public, presenting sanitary and good conditions for treating the injured soldiers; the reality proving the contrary was revelaed years later through the archives. Now, the question remains to be, whom can we really trust, in an age that forces all of us to think that we are surrounded with tools of manipulation. We are living in an era, where the silent cooperations between media and governments reign. We no longer strive for communication, we have all means of communication at our disposal; yet we strongly long for unfiltered and unbiased information. To that end, self-awareness and conscious decision making, together with critical thinking may be our greatest weapon. As was also explained in the article written by Berk Kocaman, “The busines model of almost all companies operating on social media and on the internet are profit-driven via personal information. This is called Network Effect; where a good or service becomes much more valuable with the marginal increase in the number of its consumers. Put differently, network effects are the incremental benefit gained by an existing user for each new user that joins the network. And the companies who benefit the most from the Network Effect, GAFAM (Google, Amazon, Facebook, Apple ve Microsoft) become dataopolies. One important aspect of the network effect that is relevant to the subject of this article, is its ability to reach out to masses, to constitute a tool of communication even under oppressed regimes. We have all witnessed Facebook and other social media platforms triggering protests, civil movements, uprisings or accelerating the already existing ones. In Turkey’s case, Gezi Movement has left its mark in the history of modern Turkey. Turkish youth during Gezi have communicated via all available social media tools, headed by Twitter; and managed to stay informed and act in masses despite all the counter-efforts. We have also witnessed the rise of “Arab Spring,” in Egypt’s Tahrir Square protests. Based on a survey of participants in Tahrir Square protests, it was possible to demonstrate that social media in general, and Facebook in particular, provided new sources of information the autocratic regime could not easily control and were crucial in shaping how citizens made individual decisions about participating in protests, the logistics of protest, and the likelihood of success. It was also possible to demonstrate that people learned about the protests primarily through interpersonal communication using Facebook, phone contact, or face-to-face conversation. Controlling for other factors, social media use greatly increased the odds that a respondent attended protests on the first day. Half of those surveyed produced and disseminated visuals from the demonstrations, mainly through Facebook. The aforementioned impact of social media and network effect sound all very effective and penetrating, but the flip side of the coin is that the detrimental effect of these platforms is as powerful. Wael Ghonmin is one of those credited with kickstarting the Egyptian revolution with a simple, anonymous Facebook page: We are all Khaled Said, set up in homage to a 29-year-old man who had been tortured to death by the police. It gathered 100,000 followers in three days and quickly became the most followed page in the Arab world. But then the euphoria faded, he stated during his TED talk in 2015, we failed to build consensus and the political struggle led to intense polarization. Social media quickly became a battlefield of misinformation, rumors and trolls, the same tool that united us to topple dictators eventually tore us apart, he said. Uncensored media and unbiased social media, is it ever possible? The famous Lincoln quote reads as “you can fool some of the people all of the time, and all of the people some of the time, but you cannot fool all of the people all of the time.” Lincoln surely did not consider the power of media and most importantly government’s power to manipulate it at the time. Harari also draws attention to this failure of democracy in his latest book “21 Lessons for the 21st Century” “government control of the media undermines Lincoln’s logic, because it prevents citizens from realising the truth.”  By keeping media under its control, governments manage to blame others for all their failures; and point the finger at various power groups, may it be other governments, or either internal or external forces and threats, regardless of whether they exist as claimed. This way, governments can construct a solid structure of constant manipulation and prolong their ruling so long as the counter-forces enter the picture due to whatever reason. Information flow and accessibility under authoritarian regimes is highly restricted. Broadcast media tend to be controlled by the government, journalists face restrictions, and censorship, and communication between citizens is often subject to surveillance and repression. Authoritarian regimes not only discourage individual participation, but also control the communicative infrastructure in ways that make it difficult for citizens to coordinate effective collective opposition. Social media alter the key principles of collective action and thus, create new vulnerabilities for even the most durable of authoritarian regimes. Given the Cambridge Analytica scandal and knowing how misinformation and fake news disseminated via social media platforms caused chaos in various places like Egypt or Myanmar to name a few, we are already well aware of the catastrophic aspect of social media platforms. Biased media too, create the same adverse effect on a different medium. Yet, if a democratic ground may be reached via independent media and through sources of information freed from misinformation and fake news, the positive aspects of social media will outbalance the risks it contains. Those manipulating the media and other sources, thus preventing the society from developing counter arguments, which may later grow into larger demonstrations of civil power; may then be forced to dissolve and cease under the sphere of influence of righteous minds and words, even with the danger of truth being clouded by misinformation and fake news. The complexity of this issue shall not be interpreted as no solution at all. This shall however mean that the solutions are unlikely to be simple and straightforward. It may only be achieved by serious amount of work that requires contribution at global level and even a new social contract to be designed by the joint efforts of governments, non-governmental organizations and academia from all around the world. Harari, Yuval Noah. 21 Lessons for the 21st Century. J. Cape, 2018.